This battery pack means you only ever have to carry around a single Lightning cable, but you pay a lot for the convenience. Carrying along a portable battery pack is a convenient way to avoid hunting for a plug when you travel, but it can also mean carrying around multiple charging cables. For those that use Apple devices, the fact that our iPhones and iPads use a Lightning cable while our battery packs recharge via micro-USB or USB-C can be a real hassle. Now, Mophie makes Apple-exclusive versions of some Powerstation products that eliminate the multi-cable headache. They’ve got Lightning ports for power input, so the same power adapter and cable used to charge up your phone can be used to charge up the battery pack. They’re only sold on Mophie’s site and Apple stores. The new Powerstation Plus comes in two sizes: a regular model with 6,000 mAh of battery life for $80 and an XL version that is slightly larger, has 10,000 mAh of battery capacity, and costs $100. I tested the big one, and I recommend it over the smaller one (the size difference is minimal, but you get 66 percent more capacity for a 25 percent higher price). The Plus models are distinct from other Powerstations because they have little built-in cables to charge your phone or tablet. In the case of these Apple exclusives, that’s a Lightning cable—other Powerstation Plus models have a micro-USB cable with a Lightning adapter. They’re attractive enough, with a rubberized outer edge and cloth-covered sides in four colors: black, grey, teal, and dark blue. It gives them sort of a warm and inviting look and feel, but the cloth cover gets marred up fairly easily by detritus in your bag and is more difficult to clean. An integrated Lightning cable makes it easy to charge your iOS devices, and you can use the 10W USB-A port at the same time. 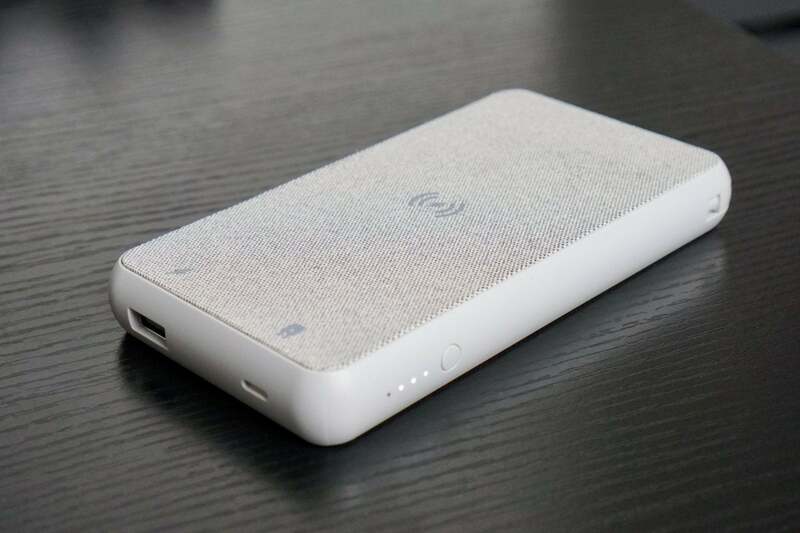 The size is relatively compact for a 10,000 mAh pack, and you’re not limited to the built-in Lightning connector. There’s a 2.1A USB-A port as well, and this pack can kick out enough juice to power that port and the built-in Lightning cable at the same time. If you plug a device into the battery and plug the battery pack into an outlet to charge, it’s smart enough to prioritize charging your gadgets first, and the battery pack after. I can’t quite figure out the purpose of the Qi-enabled wireless charging pad on the XL-sized unit, though. I would love to slap my phone down on this thing and let it charge up, but that’s not how it works. Instead, the wireless charging is a receiver, so you can put the battery pack down on a Qi-enabled wireless charging pad to charge the battery pack. That seems almost silly. 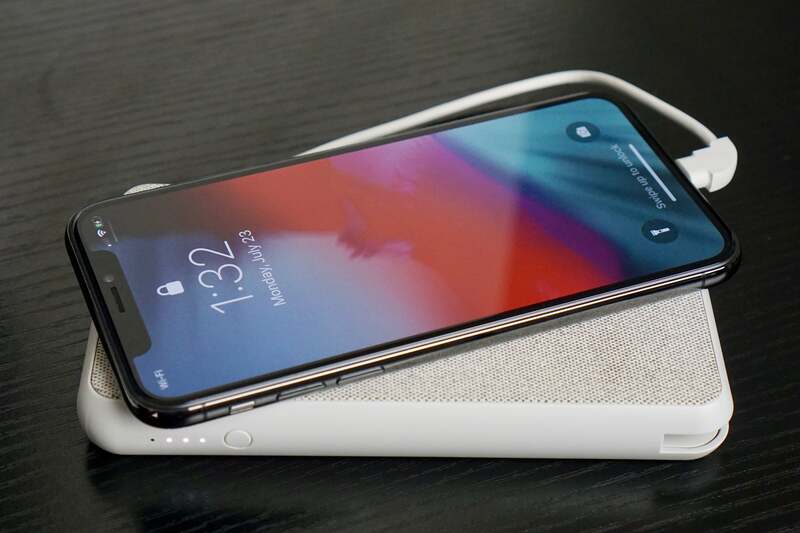 Wireless charging is great for when you set your phone down on the desk for an hour or two, but it’s far too slow to be practical for charging up a 10,000 mAh battery pack. Even with a wired connection to a 12W Apple power adapter, it took hours and hours to charge this battery, and a wireless charger would be even slower. Outside of the fact that the wireless charging is the opposite of what I’d expect, it works quite well. I got nearly four full charges of my iPhone X, as the 10,000 mAh rating would lead me to believe. It charges devices just as fast as the iPad charger, which is not quite up to par with USB-C chargers but still twice as fast as the 5-watt power adapter than comes in the box with your iPhone. It’s hard to recommend paying this much for a 10,000 mAh charger just because it has a Lightning input port. If you’re willing to carry around a USB-C or micro-USB cable to charge up the battery pack with, you can get a whole lot more bang for the buck. Still, Mophie’s Powerstation Plus XL is compact, reliable, well-built, and does what it says it will do. It’s just not a good value unless you stumble upon a big sale, and I can’t for the life of me figure out why it’s a wireless power receiver instead of a charger. Plenty of power for its size and weight, with an attractive rubber-and-cloth finish. The integrated Lightning cable and Lightning charge port are convenient for Apple users, but you can get similar products with micro-USB for half the price.